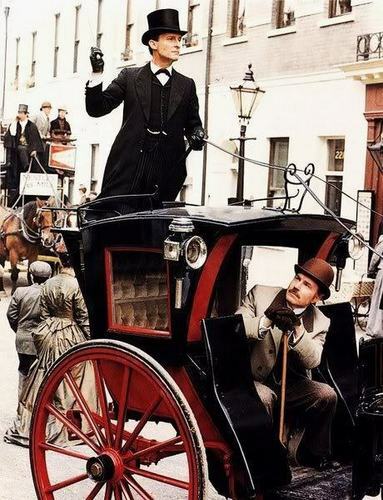 Homes and Watson. . Wallpaper and background images in the Sherlock Holmes club tagged: jeremy brett sherlock holmes holmes granada television john watson watson. This Sherlock Holmes photo contains 역마차 and 무대. There might also be 척 왜건, 척 웨곤, 물림 쇠 수레, 사 인승 사륜 포장 마차, 바로크, barouche, 마차, and 장비.